Hungary Shark. Finished in a stunning shade of custom blue, wearing a genuine Hartge body kit and enhanced with a selection of period additions, this air-ride E28 is a slice of seriously cool retro-chic. Words: Aron Norris. Photos: Krisztian Bolgar. Beauty is in the eye of the beholder, as they say, which is why modified cars can be so polarising. The modifying game represents a sub-culture of individuals unable to leave cars in stock form, no matter what. It’s in our blood to make changes to our cars, representing our individuality through them, simply because we don’t want to drive what everyone else does. It goes without saying that this publication is a safe haven for BMW enthusiasts, but that doesn’t mean we all like the same things; some of you will prefer lightly breathed-on OEM+ whereas others will require nothing less than lairy body kits and Day-Glo paint schemes to satisfy your modified needs, but no matter what style you’re into, it’s hard to argue with a classic shark-nose BMW embellished with period correct modifications. The rise to fame of Rusty Slammington, built by Mike Burroughs, created a buzz around the E28 chassis and flaunted the immense potential these cars have. E28s have quite rightly become the car of choice among BMW enthusiasts looking for a cool 1980s saloon. Thanks to a plethora of off-the-shelf performance parts and prices for decent E28s remaining surprisingly low, the E28 is the perfect project car, leaving plenty of budget for those all-important modifications. Belonging to the “shark-nose” family of BMWs designed by the brilliant Claus Luthe, the executive four-door E28 was launched in 1981 and continued BMW’s long-standing tradition for well-built, great handling cars. As a replacement for the E12, the E28 was aimed at middle management family types who wanted a prestige German car which both drove well and looked good in the office car park in a quietly confident and assured way. As BMW owners go, Endre Richard Farkas is a big, big fan of all things retro. “I have always loved late 1970s’ and early 1980s’ German cars, particularly the BMW saloons,” he remarks when explaining how he fell in love with the E28. Endre, 28, hails from a small town called Ozd in Hungary and his oh-so-’80s shark has got some serious bite. By any standards the E28 is a handsome car with all of the right retro styling cues, so hit one with the modifying stick and you’re onto a sure-fire winner. As a long-term admirer, Endre’s E28 lust led him on a wild goose chase across Hungary in search of his next four-wheeled victim, destined for the chopping block. “Modified BMWs have a huge following in Hungary, heavily influenced by German and Belgian tuning styles” he says, reflecting on the rise of “stance” culture in Eastern Europe. 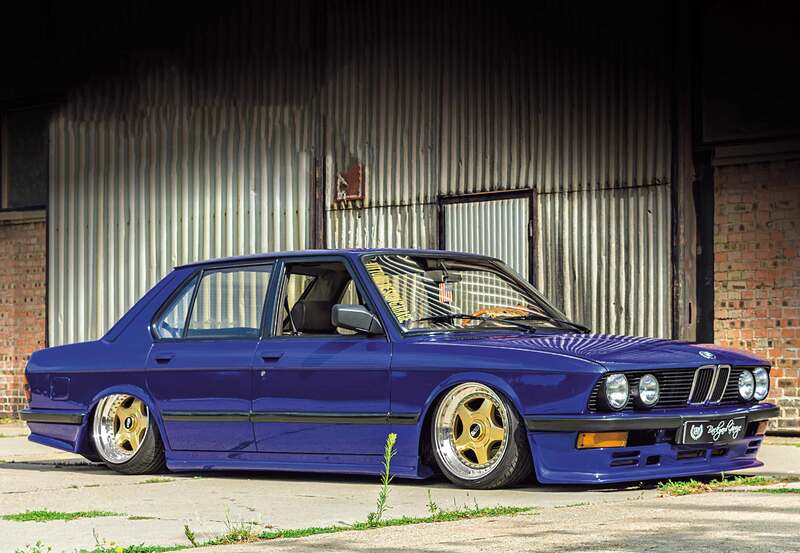 As a big fan of very low BMWs, having previously owned, among others, a modified two-door E30 320i and an outrageously low E36 running 11s on the rear, Endre was no stranger to modified metal, so his E28 project was always going to end up on the deck, tucking wide wheels, looking sassy. Nothing worth having comes easy in life, and the same can be said for this build… “I resigned myself to buying an E28 that would need welding and rust repairs, since most of the Hungarian examples within my budget were in poor condition” he explains, reflecting on his challenging search criteria. Undeterred, Endre rolled up his sleeves and scoured the Hungarian classifieds over the course of a few months, finally stumbling across a 520i which he saw good potential in. “I found a rusty but totally complete 1985 Bronzitbeige 520i not far from my home town and decided to take a risk on it, knowing that the car would be booked in at my friend’s body shop straight away, I was excited to start building my dream E28” grins Endre. The deal was done and he was finally the proud owner of an E28 and the real fun could commence. First stop, an expert full-body restoration to rid the car of any damaged panels and rust. With the welding and body prep work completed, it was time to purchase the retro touches he had promised himself before hitting the E28 with a full repaint. You may have noticed that this E28 wears a rather special retro body kit and it is the coveted Hartge bumper and side skirt extension kit. 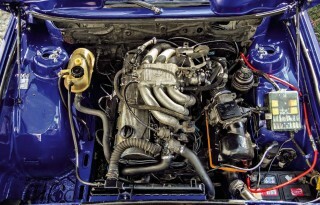 For those who aren’t au fait with the work of Hartge, they were BMW wizards, famous for shoe-horning big BMW engines into smaller BMW engine bays, creating wild versions of our favourite BMW models with cool retro add-ons. With the genuine Hartge cars fetching serious money due to their sheer rarity, finding aftermarket Hartge parts is a needle in a haystack situation, but Endre struck gold when he found a full kit for sale in Hungary and snapped it up pronto. “The Hartge kit felt like the finishing touch for the project, because it’s rare and out of the ordinary” he says proudly, and we’re not going to argue with him on that – it’s a joy to see such rare parts put to good use on a car like this. With everything in place and his needs for rare add-ons satisfied, Endre set about deciding on a new colour for his E28, because the original Bronzitbeige just wasn’t going to cut it. 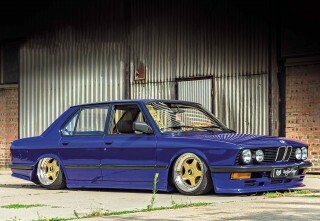 He knew all along his E28 would undergo a full colour change to blue but couldn’t decide on a specific shade, so a completely custom hue was mixed up following discussions with his body shop. The final colour remains a sworn secret between him and his paint shop guy, ensuring his car remains completely unique. The final look is both aggressive and classy, with a few blink-and-you’ll-miss-them touches like OE Shadowline rear lights and colour-coded door handles; the non-OE paintwork gives this E28 a completely fresh look. The overall aesthetic is all the more menacing thanks to some serious upgrades in the suspension department. If you plan on going low, there’s no point messing around, which is exactly the approach Endre has executed here. “You just can’t beat the flexibility of air-ride,” he beams and he can be proud of the way his E28 now meets terra firma. “I decided to build my own fully-custom adjustable suspension setup using KYB shocks and universal air bags because I knew exactly how I wanted the car to sit,” he says. Talking of stance, it’s impossible not to notice the rolling stock tucked under the arches of Endre’s E28, not least because there are few wheel brands which stir up the emotions that BBS does among car enthusiasts. With all of their motorsport heritage, BBS wheels are the epitome of German engineering and build quality. Given that so many BMW racing cars down the years have rolled on BBS wheels, it’s no surprise that they look incredibly good on road cars, too. The appeal of custom offsets and finishes was too much for Endre to ignore; in addition to perfectly following his period correct theme, his heart was set on building the perfect made-to-measure set. With BBS famous for their mesh designs, the BBS RF was somewhat of a deviant when it arrived on the BBS line-up in the ’80s. A simple (easy to clean) five-spoke three-piece split design the RF, or “Design 5000” as they were known, became a huge success story for BBS and are a firm favourite of Endre’s; “I love the BBS brand, especially the three-piece RS and RF,” he says. His wheel build was a precise process, with lots of time spent working out offsets and final fitment. To complete the look, the RF centres were refinished in classic BBS Gold, contrasting against polished dishes and custom gold spike bolts, creating one hell of a custom wheel setup. “I knew exactly how I wanted the wheels and fitment to look all along,” he says with a smile, explaining his master plan for the car. The result of Endre’s wheel planning is sheer E28 perfection, with a pair of ET25 9x17s running 195/40 tyres at the front and the impressively girthy ET15 10x17s shod in 205/40/17 rubber at the rear. This E28 looks fantastic aired-out. Stock M20B20 is powerful enough for this cruiser. Nardi Torino steering wheel and analogue air pressure gauges. Custom-built 17” BBS RFs. 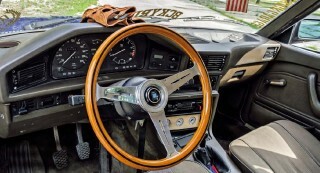 Talking of road trips, he spends a lot of time behind the wheel of his E28, the interior of which has been kept completely OEM in all its retro-goodness, apart from the addition of a Nardi Torino steering wheel. The original velour seats remain, as do the vinyl door cards, which keeps the ’80s look and feel of this classic saloon. Endre’s journey with this car hasn’t been an easy one, because he’s actually had to bring it back from the dead twice. Saving the car from the crusher was his first assignment, but things got even more challenging when the E28 was driven into not long after it was completed. “The front end was totalled, but thankfully I could salvage the rare parts and go again,” he reflects, reliving the setback which held up what ended up being a one-and-a-half year build. This E28 is proof that patience is a virtue and that under the right ownership, some cars just refuse to give up. Very much like Rusty Slammington, there must be something in the E28 waters, because this is another shark which just refuses to die, and we’re grateful for people like Endre helping to keep them alive.